Blairsden, California. Two hours West is Chico and its iconic Sierra Nevada Brewing Company. An hour Southeast is popular up-and-comer FiftyFifty Brewing in Truckee, known for their Eclipse barrel-aged series of beer. In between these breweries, amongst the rivers, trees, the deer who fancy jumping into traffic, the small towns that dot the landscape, and the long winding canyon you must navigate to reach it, is The Brewing Lair. 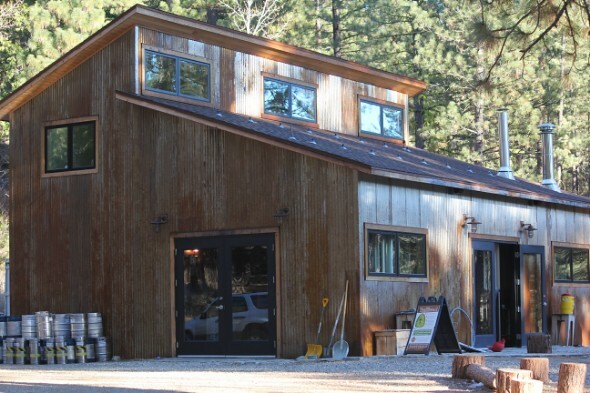 Situated in the heart of California’s High Sierras in Plumas County, this small brewery is located on CA-70 in Blairsden. The holidays and visiting family would bring me to Quincy, which is 24 miles northwest of Blairsden. The last few times I visited Quincy, I had always heard about a new, local craft brewery, but I had never taken the time to check it out. Luckily, or unluckily, Quincy is a small town and there isn’t a ton to do and we decided to check it out. Blairsden is quite small as well, in fact, it is dwarfed by Quincy at just 39 people according to a 2010 Census. Given the size of the town it calls home it would only be fitting that the brewery would be small as well … which it is, with its 15 barrel brewhouse. After an afternoon of watching kids play in the snow at Johnsville Ski Hill, it was time for the adults to take some time for themselves. The Brewing Lair was first called Under Cover Ale Works with a spy theme, but after a cease and desist from Lagunitas Brewing, who has registered the marks “Undercover” for their Undercover Shutdown Ale, it changed to Spy Craft Ales, and then they eventually settled on The Brewing Lair, paying homage to the Sierras around them. Just a short drive from Johnsville, if you didn’t know what you were looking for, the road into the brewery would be easy to miss with just a small sandwich board telling passing motorists where they’re located. Luckily we knew where we were going and turned right in. The road in is unpaved and surrounded by pure nature and greenery, with a few brewery dogs to welcome in thirsty travelers. As we followed the dirt road, we passed frisbee golf baskets, picnic tables, and a fire ring with chairs situated around it, which were begging for a pint, a warm fire, a cool evening, and good company. All but the saison were rather hop forward with a lot of character, but Incognito Saison was the group favorite. With banana, clove, and loads of fruit courtesy of the Belgian yeast, we each enjoyed a pint of it followed by a growler we brought home with us. If you’re in the area, be sure to check out The Brewing Lair. More information can be found on their website.